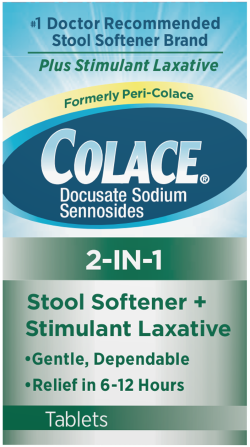 Treat occasional constipation – including constipation associated with certain medical conditions – safely, gently, and effectively with Colace® 2-IN-1 Tablets. 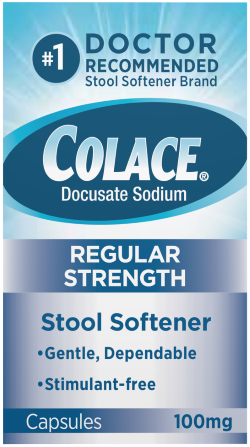 The active ingredients in Colace® 2-IN-1 Tablets are docusate sodium and standardized senna concentrate. These ingredients are used together to help relieve occasional constipation. 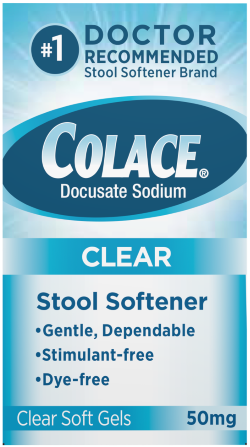 Docusate sodium works to soften the stool. Standardized senna concentrate is a laxative that helps to gently stimulate motility of the intestines. Take only by mouth. Doses may be taken as a single daily dose, preferably in the evening, or in divided doses.